Gavin Upson of 1-DA Shapes crafting rails. There are plenty of factors including your own performance that help determine how a board will perform. Some of the biggest factors, however, are directly related to the outline of the surfboard. The Nose, Rails and Tails and how they are linked together are massive in creating a good board. While individually these elements are going to give you certain outcomes, it’s how they relate to each other in combination that’s really going to make a magic board or a dud. The first third of your board is known as the nose. When we talk about nose width, we take that measurements from 12 inches down from the tip. 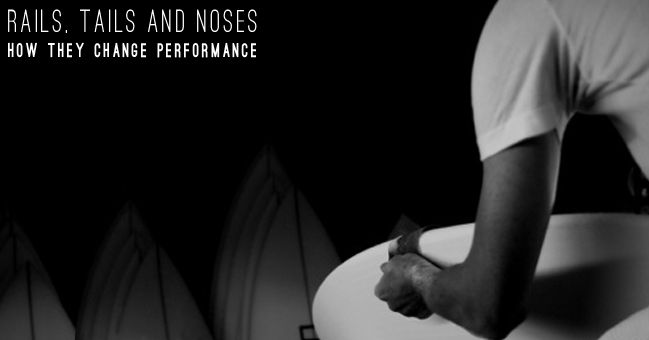 The shape of the nose is a key element in how the board paddles and catches waves. The wider or rounder the shape of the nose the more boyent it is and therefore, the higher the front of your board will be in the water while you’re paddling. This is due to the increased surface area in the front. This extra surface area works really well on small wave grovelers, long boards and mid length boards the help you get onto smaller/softer waves,and help to provide stability. The other end of the spectrum is the pointier, narrower nose that’s more commonly found on higher performance boards. While a narrower nose won’t help as much when paddling into waves – apart from when taking a late drop – it’s definitely going to help you with your performance surfing. With a pointier nose, you will get more curve in the overall rail line of your surfboard which helps you to fit into the pocket of hollower waves and helps stop you from pearling (when your nose sticks into the water) when coming out of big turns. Duck diving is also easier with a pointier nose due to the less volume. From left to right: the Panda Doinker Egg, the Hypto Krypto by Haydenshapes and the Mad Cat by SUPERBrand showing how different nose shapes effect performance. Your rails are also going to play a huge roll in how your board will surf. Because the rails span from the tip to the tail of your board, they are going to require a lot of attention from your shaper when they’re creating your board. There are many descriptive terms for rails, as well as an unlimited number of ways that they can be blended. But basically, every surfboard is going to have either a Soft Rail or a Hard Rail. These can then also be either full or tapered. This means you can end up with a ‘full soft rail’ a ‘tapered soft rail’ or a ‘full hard rail’ or a ‘tapered hard rail’. Canvas Surfboards Ryan Engle working on some rails. Generally, Soft Rails are going to perform better in smaller gutless surf conditions and on longboards, mid range boards and blended into fish and some small wave grovelers. Usually a rounder, more full rail with different foils. Hard Rails, which are more commonly found on higher performance boards, have a more defined edge at a certain point around the curve of the rail towards the underside of the board. This helps the rail to bite into the wave face a give you more hold in critical surf and helps you respond better through turns. 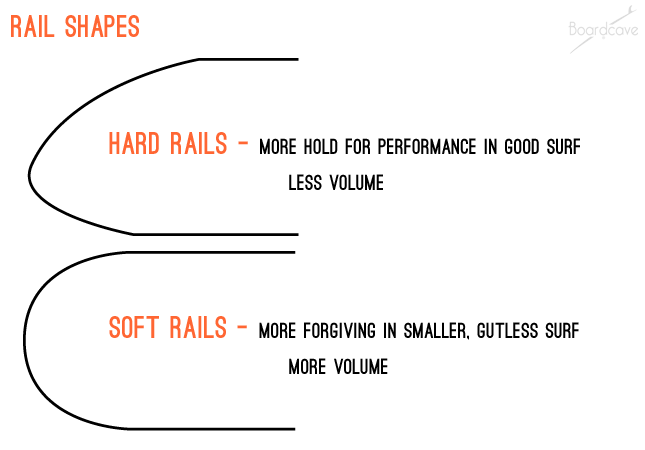 Hard rails vs soft rails. Whether you have a hard rail or a soft rail, the more full the rail is, the more buoyancy you will get, which relates to drive and projection when coming out of turns, as well as how stable the board feels and how easy it is to paddle. With a more tapered rail, you are able to sink it into the water more easily, which gives you a nice quick feeling coming into turns as well as surfing rail to rail. You may find though, that these rails will lack drive coming out of turns. The tapered rails are generally less forgiving, especially when you accidentally dip your rail into the wave when you didn’t mean to. Finally, the general foil of your rail will make a difference in performance. The exact foil of your rail can be different in each model, however there are a few trusted foils generally used, which are 50/50, 60/40 and 80/20. This relates to where the apex of the rail is around the curve. 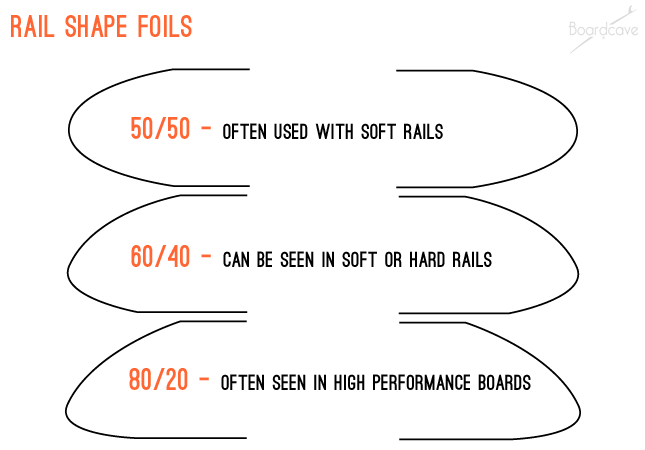 A 50/50 foil is found in more soft rail options and traditionally on longboards. A 60/40 rail is going to be turned down with the apex slightly under the middle of the curve of the rail. This type of rail can be blended into both soft and hard rails and is also a great option on smaller wave grovelers, fish and fun boards options. They generally give you a good blend of maneuverability and stability. The next style, the 80/20 rail, is when the apex is even closer to the bottom of the board. These rails are commonly found on high performance boards and usually incorporate a hard edge – hard rail when getting closer to the tail. These are made for easy maneuvering and rail to rail surfing as well as performance through turns. Different foils help your rail bit into the wave for better performance. These are just some general types of rails and there are plenty of variations for each board and throughout the length of the rail of the board depending on the intentions of the shaper. The shaper also has to consider the overall length of the rail line in the water as well. With a longer, straighter rail line you are going to get more speed in a stright line, whereas when you have a curved rail, you will increase maneuverability. It is finding the happy balance of all these factors that makes shaping the rail one of the most crucial elements in the shaping process. Rails and tails combining with a double wing on Chemistry Surfboard’s Wide J 6 model. Finally, rounding out the end of the article, and the board, is the tail of your surfboard. As with everything else, the exact size, shape and volume of the tail is essentially endless. But let’s look at some of the basic fundamentals shapers will follow in most tails. 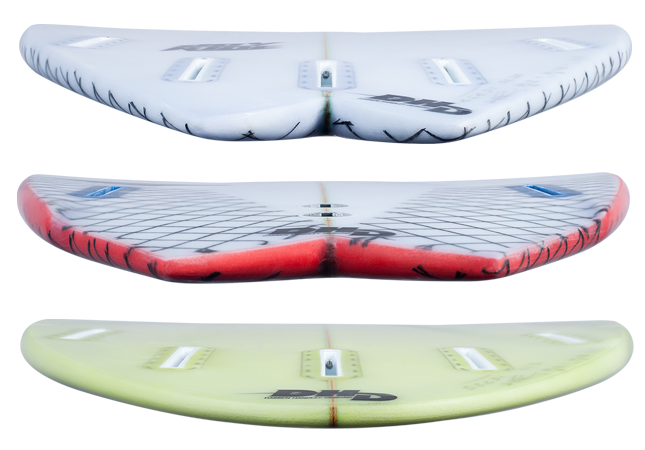 Different tail shapes from top down: DHD Surfboards the Joyride, the Twin Fin and the Pocket Knife. Wider tails offer more stability and float, and will give you a faster planing speed. Narrower tails are going to make rolling from rail to rail a little easier, and can also help with your hold on a steeper faced wave. A tail that has rounder angles or no angles, is going to help you ‘hold’ the water for a little longer. This will translate into more control of the board. When you get harder angles in the tail, more water will “release” and give you a looser, more snappy feel to the board. A rounder tail is better for a more open face wave with a little more size and carving potential. In more punchy, shorter waves, a harder angled tail will help you get as many snaps as possible. Basically there are around 5 or 6 major tail categories with an unlimited amount of variations in each, with some being blended together. An interesting tail option from Panda Surfboard with a some nice artwork. The main surfboard tail types are the squash tail, the square tail, the pin tail, the round tail, the swallow tail and the asymmetric tail. The squash tail is the most common found on surfboards. With a more square back end with rounded corners, you get the snappy feel of a hard-cornered square tail blended with a little more hold and release of water. They also give you that extra width which helps with slower sections of the wave. A square tail is similar in principle but with harder corners giving you a skatier feel with extra release. Great for down the line speed in smaller conditions, the hard corners act as a pivot point for turning the board. The square tail is a more traditional tail type that is less common these days as the squash tail gives a similar feel with more to it. For slightly bigger days with open faces, a round tail is a great option. With a continuous curve to help your hold on the water, you can gain more control on bigger, more hollow surf. The round tail is a great option for open face carving with plenty of width to give more lift when outside of the critical section of a wave. 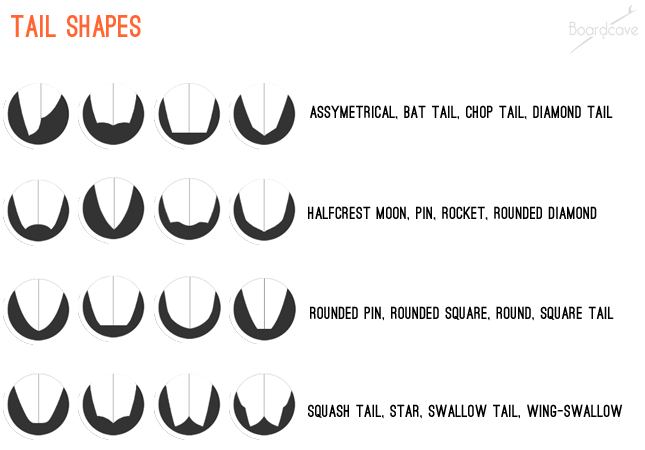 Just a few of the common tail shape types – there are also variations on each of these. The pin tail is a staple among many step up options and guns, where you may find yourself in the barrel or powering down the line in steeper, bigger waves. With less turning ability needed, these boards give you plenty of hold in bigger, more hollow surf. And giving you a wider tail for increased planing speed, the swallow tail is a great small wave board option. Don’t count this option out when it is barreling though, it also gives you hold in steeper waves (like two pin tails) and can be a blast in steeper faced waves. Also a ton of fun when turning on the rail. It is however, harder to transition from rail to rail when trying to bust turns after turn. Finally, we get to the asymmetrical tail. The asymmetrical tail occurs when your board has one side with a longer rail line and different shape to the other side. The idea behind the asymmetrical tail is to give you different performance dedicated to your toe side and your heel side separately. Asymmetrical surfboards have many characteristics to them, however, looking at the tail is definitely the most obvious feature. Your entire rail line, your foil as well as the nose…essentially every factor of one side of the board over the other needs to be looked at for the difference in front side to back side surfing. 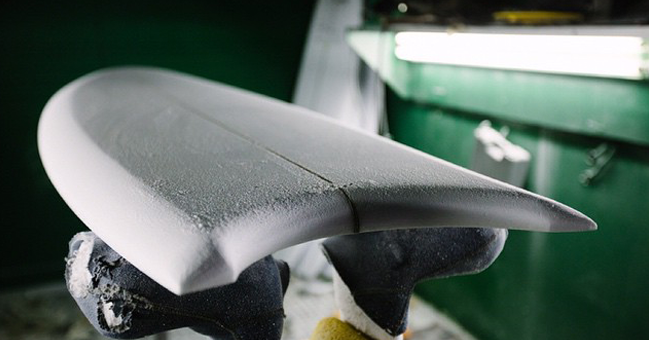 A nice little half-crest moon tail on a Chemistry Surfboards model in production, The Experimental. 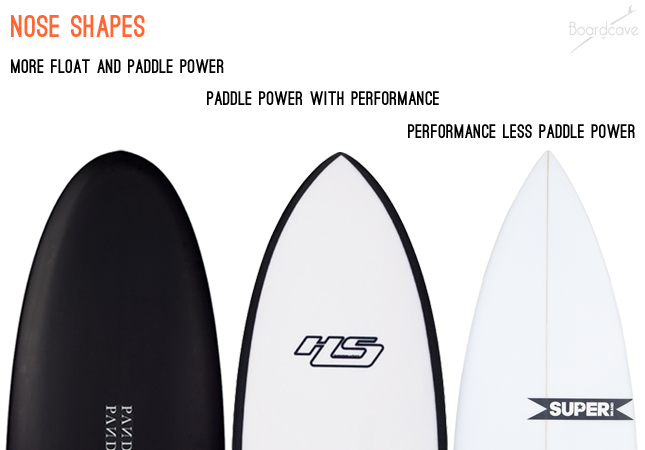 Basically, all these features are interrelated when it comes to surfboard design. Every surfboard model has a different blend of these factors and there are plenty of combinations to try out. 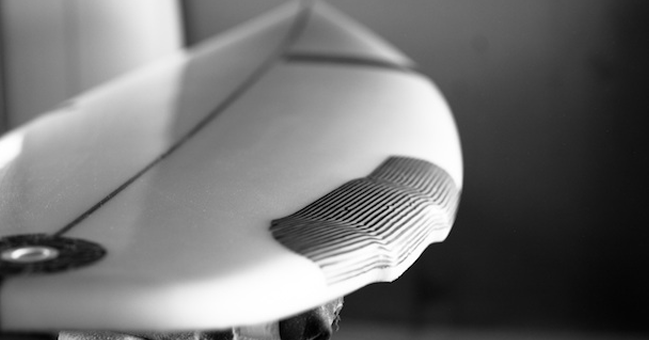 The balance and interaction between each element is going to determine how your surfboard will perform. While there are some tried and true design elements that can be commonly found in surfboards, it is the experimenting with different blends that bring about new developments and keeps surfing fun. Have a look at a range of surfboards or use the Board Engine to find a combination that will work best for you and don’t forget to keep trying new things. Share your thoughts and experiences about surfboard shaping in the comments below! To keep up to date with our latest articles, make sure you follow us on the Boardcave Facebook Page and on our Boardcave Instagram.